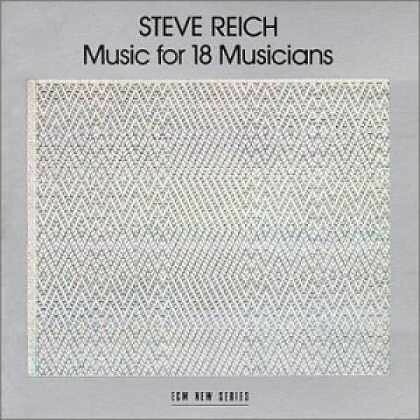 “Music for 18 Musicians is a seminal work of musical minimalism composed by Steve Reich during 1974-1976. Its world premiere was on April 24, 1976 at Town Hall, New York. Following this, a recording of the piece was released by ECM New Series. Music for 18 Musicians was written for a cello, violin, two clarinets (both players double on bass clarinet), four pianos, three marimbas, two xylophones, a metallophone, and four women’s voices. In the introduction to the score, Reich mentions that although the piece is named Music for 18 Musicians, it is not necessarily advisable to perform the piece with that few players due to the extensive doubling it requires. With only 18 musicians. The piece is based around a cycle of eleven chords. A small piece of music is based around each chord, and the piece returns to the original cycle at the end. The sections are aptly named “Pulses,” and Section I-XI. This was Reich’s first attempt at writing for larger ensembles, and the extension of performers resulted in a growth of psycho-acoustic effects, which fascinated Reich, and he noted that he would like to “explore this idea further”. A prominent factor in this work is the augmentation of the harmonies and melodies and the way that they develop this piece. Another important factor in the piece is the use of human breath, used in the clarinets and voices, which help structure and bring a pulse to the piece. The player plays the pulsing note for as long as he can hold it, while each chord is melodically deconstructed by the ensemble, along with augmentation of the notes held. The metallophone (unplugged vibraphone), is used to cue the ensemble to change patterns or sections.